Final Fantasy XIV is one of the most popular multiplayer game that was released back in 2013 and was available for PlayStation 4, PlayStation 3, MacOS and Windows PC. However, at times while playing the Final Fantasy XIV, the users may face several errors and one of them is Final Fantasy XIV launcher error 21667211. Today, in this post, I will show you how to fix A system error has occurred – 2146697211 error on Windows PC and Mac. The Final Fantasy XIV error 214667211 occurs when you try to launch the game. As you try to open the game, you will be greeted with this error “Final Fantasy XIV 214667211”. This error is annoying because it doesn’t let you play until the error is resolved. The main reason for Final Fantasy XIV error 2146667211 is server connectivity. When the game is unable to connect to the game server, it will throw this error to let the user know that there is some problem with the game. Fortunately, the error is relatively easy to fix. However, what is not easy is knowing which fix will work for you. Since the error is related your PC and Internet connectivity and not about the Gaming server, there are several possible solutions for this error. In this post, I have listed all the possible fixes to solve Final Fantasy XIV error 2146697211. As I said earlier, there are no go-to fixes for this error. However, all the fixes are easy to follow and very general in nature. The first and foremost thing one should do when facing any error is restarting the system that is giving the error. At times, the error can be temporary, and a simple restart can fix the error and allow you to play the game. If restarting the system did not fix “A system error has occurred – 2146697211” error then follow other recommended fixes. Another common way to fix the A system error has occurred – 2146697211 is to enable the SSL 2.0, and TLS 1.2 options in your “Internet Options” advanced settings. Here is how to do it. Open “Internet Options“. To do this, type “internet options” in Cortana / Search bar. Alternatively, go to Control Panel > Network and Internet > Internet Options. From the “Internet Options” click Advanced tab. 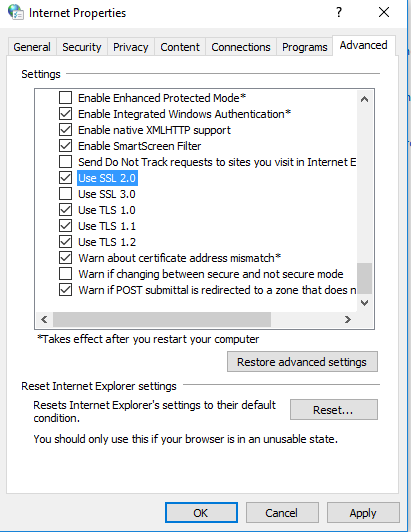 Under “Settings” section, scroll down and find ” USE SSL 1.2” and ” Use TLS 2.0” option. Tick ( check) both the options. Now you need to restart your PC. Save any unsaved work and restart your PC. Once up, try to launch Final Fantasy XIV, and this should have fixed the problem. Another reason why you are facing A system error has occurred – 2146697211 could be because the Firewall is blocking access to the Final Fantasy server thinking it as unsafe. So, what you need to do here is add the Final Fantasy website to trusted site list. Go to Control Panel > Network and Internet and click “Internet Options“. Next, click “Security” tab and select “Trusted Sites” option. Click “Sites” button and a dialogue box will pop-up. In the given field add “https://ffxiv.com” and click “add“. Now close the Internet Options window and restart your PC. After the restart, try to launch Final Fantasy and see if the FFXIV 2146697211 error is resolved. If nothing seems working, you can try disabling the Firewall on your PC. 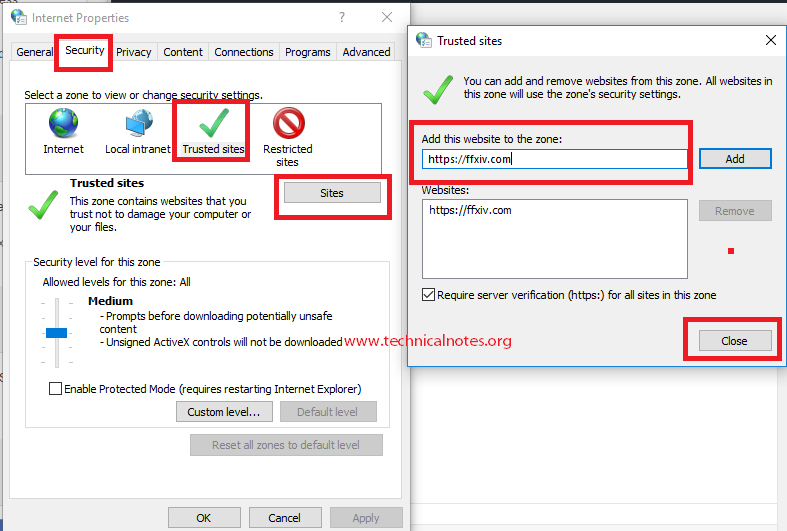 If you are running AVG Antivirus, then try to disable the Web Protection option. Here is how to do it. Disable Firewall – To disable Window Firewall here are the steps that you need to follow. Type Firewall in the search/Cortana tab. Or Go to Control Panel > System and Security > Windows Firewall. From the left side, click “Turn Windows Firewall On or Off” option. Now Turn Off Firewall for both public and private network. Once done, click OK and save the changes. Now try to open Final Fantasy XIV on your PC and see if that has resolved the error. In case you are using a third-party Antivirus then you have to disable the Firewall and Web Protection feature from the Antivirus settings. For example, if you are using AVG Antivirus then open AVG Antivirus, click “Web” and turn off “Web Protection“. If you are using Avast Antivirus, then open Avast Antivirus > Protection and Turn off Firewall. Similarly, if you are using any other antivirus, then you should find the Firewall option in the settings. Once you have turned off the Firewall, restart your PC or Mac. Now try to launch Final Fantasy XIV and see if the error FFXIV 2146697211 is solved. At times, stopping and restarting the DNS client can fix this issue. Here is how to do it. Press Windows key + R to open Run Dialogue box. 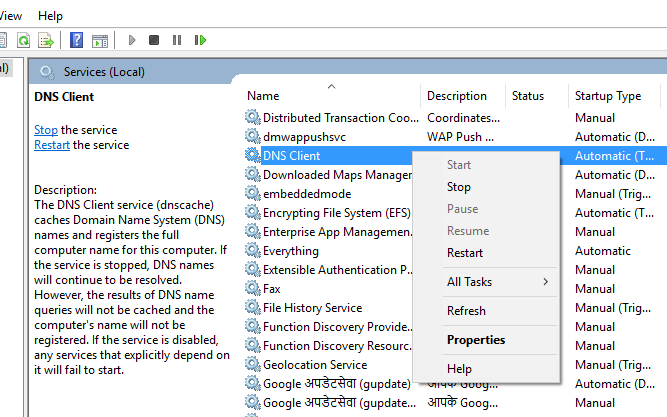 Now find DNS client in the services, right-click on it and select Stop. Next, right-click on DNS client again and select Start. If you are still facing the FFXIV 2146697211 launcher error the try these three steps and see if that solves the problem. Press and hold the reset button that you can find at the back of the modem for 10 to 15 seconds. Release the reset button after the lights on the modem start flickering. Now, wait for the Internet Light to turn green ( 3- 5 minutes). Now try connecting to the Internet and see if it is working fine. The next step is to flush DNS. At times, flushing the DNS can resolve the problem related to your internet connectivity. Here is how to do it. Open the command prompt by right-clicking on the Start button and select “Command Prompt (Admin)”. In the command prompt window type ipconfig /flushdns. The last step you need to follow is to delete the FFXIV_Boot.cfg folder. Here is how to do it. Go to Documents > My Games > FFXIV Folder > and delete FFXIV_Boot.cfg file. After the restart, try to run Final Fantasy XIV and see if the FFXIV 2146697211 error is solved.